Not sure about all you other new mamas out there, but taking baby out for little activities is our day-to-day bread & butter. These little trips outside the home seem to be so good for my little one and let’s be honest: they keep me SANE! 😉 Even when she was first born, I’d joke that I’d have something booked on her schedule every day of the week if I could. Little strolls around the neighborhood & reading books in our soft recliner are nice but my observant little one loves to get out & about, see new things, and interact with other kiddos. Now that she’s past the newborn stage, there are so many options on the table and we want to get out there and take advantage of them! This summer, the thought crossed my mind to post our daily schedule and I never got around to it…I wish I had because our weekly routine will be so different for this upcoming season! The thing is, I work really hard to research field trips, classes, storytimes, and more that are age-appropriate, fit within her nap schedule, are truly enriching, etc. Now that Fall is upon us, I wanted to share with friends & family what we’ll be up to for the rest of the year. Additionally, maybe this will help other new moms with some ideas for getting out of the house with baby in tow — it can be daunting & frustrating at times but it’s been so very worth it for us. MONDAYS: Preschool! Well, it’s really more of a Mother’s Day Out, but they’re calling it “Preschool.” Most programs don’t take the littles until they are 12-18 months, but I found a church in my area that will admit them at 6 months. I’ve taken a Mom-to-Mom Bible study class and attended Sunday worship services there, so I’m familiar with the leaders & feel that the facilities are top-notch. I’m confident this time apart from me will be beneficial for baby’s socialization & enrichment, too. Gotta admit: I’m looking forward to having a half-day to myself to take care of personal stuff, ya know? Babies aren’t exactly welcome at the dentist’s office. Mostly, I’m pumped to start taking group fitness classes again! It’s funny: once you’re a mom, even a run to Target alone can feel so oddly exhilarating! 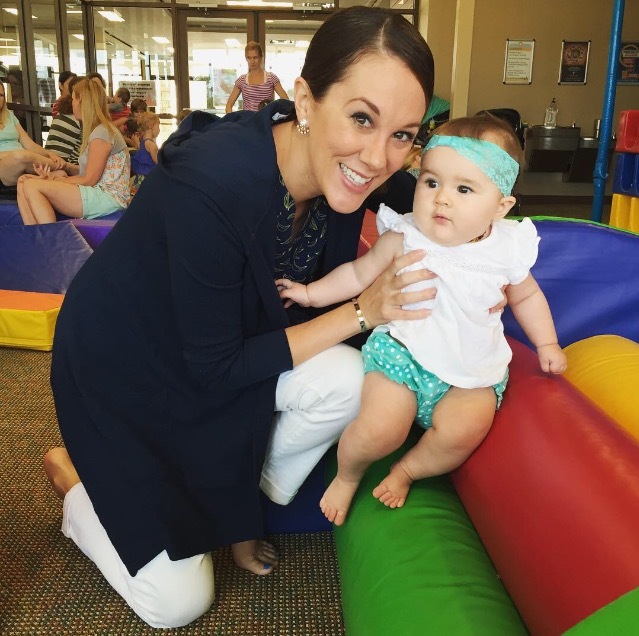 Indoor playground playdate held at the church where her preschool will be! TUESDAYS: Have you heard of MOPS before? It stands for Mothers of Preschoolers and is a ministry out to serve that exact demographic. After serving with MOPS in childcare at my old church in Kansas City, I’m thankful to finally get to participate in this program as a mom myself. They serve brunch, talk motherhood, marriage, & more — all with a Christian focus. Childcare is provided so baby girl will get to play in another ‘Sunday school’ for a couple hours. I’ll be doing the program at a different church than her preschool, but this one’s close to our home as well. It runs every other Tuesday, so I’ll be on the lookout for something fun for those alternate weeks. If nothing regular pops up, a morning at The Thinkery or Little Land Play Gym are both excellent go-tos for high-quality engagement. 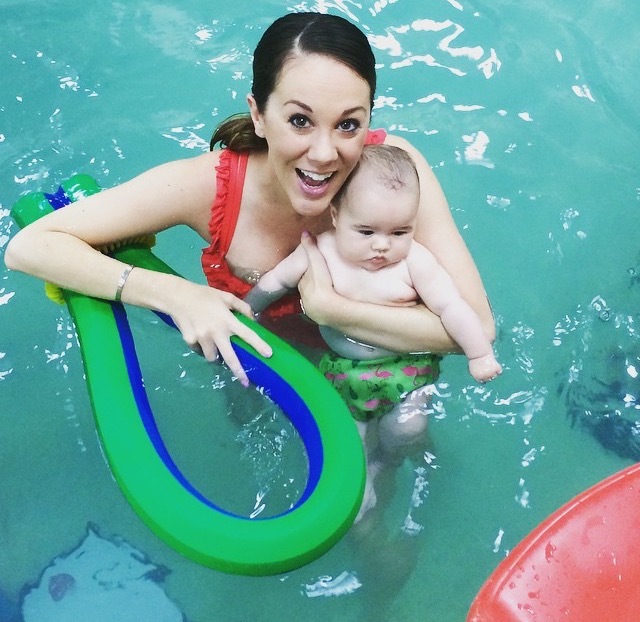 THURSDAYS: Waterbabies swim class at Emler Swim School. Yeah, they hook you in with a super-cute Bathtime Babies class that’s free for ages 2 – 6 months. That was one of our first classes to take together and it was a great bonding experience so the hubs & I ponied up for the next round of courses this summer. But let me tell ya: it’s so worth it! My 7.5 month-old can have water splashed in her eyes & down her face without tears, is calm as can be ‘floating’ on her back with ears submerged, and can even ‘swim’ underwater with 6-second breath control. You’ll notice my use of half-quotes because these activities are kind-of assisted, obviously, but still she amazes me in each class with her independence & improvement. Plus, our community is sandwiched between Lakes Austin & Travis (not to mention, lots of neighbors have backyard pools) so it’s a high priority for our daughter to know how to be safe and feel comfortable in the water. 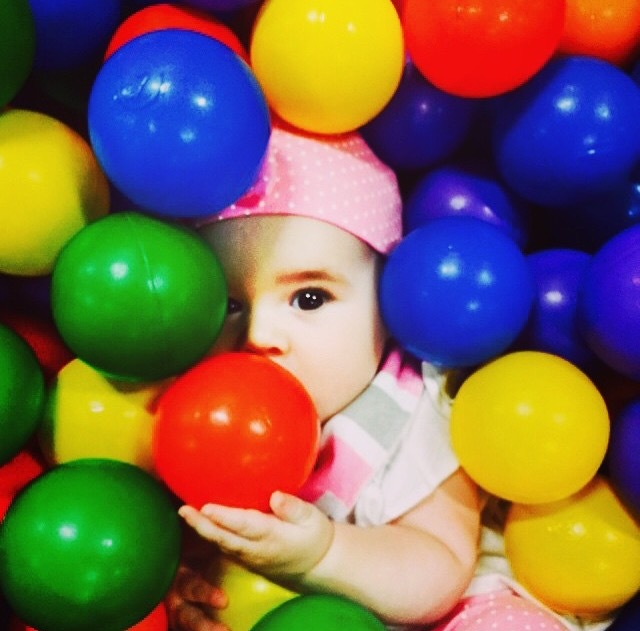 Bathtime Babies is the coolest class in all of Austin for babies under 6 months. Moments like this planted the seed for our love of swim school. FRIDAYS: Two options: Storytime with Mr. Rudy at Cups & Cones or Mr. Will in concert at Brilliant Sky Toys & Books. Storytime with Mr. Rudy is an easy casual choice because it’s right down the street and I’ll get to pow-wow with other neighborhood moms. Plus, Cups & Cones is a darling family owned small business…always good to support people like that! As for our other option, Mr. Will is our favorite local children’s music artist and now that our schedule won’t allow us to see him play Mondays at Whole Foods Market – Hill Country Galleria, we’re happy to drive over to a Westlake toy store for his upcoming Friday gigs. 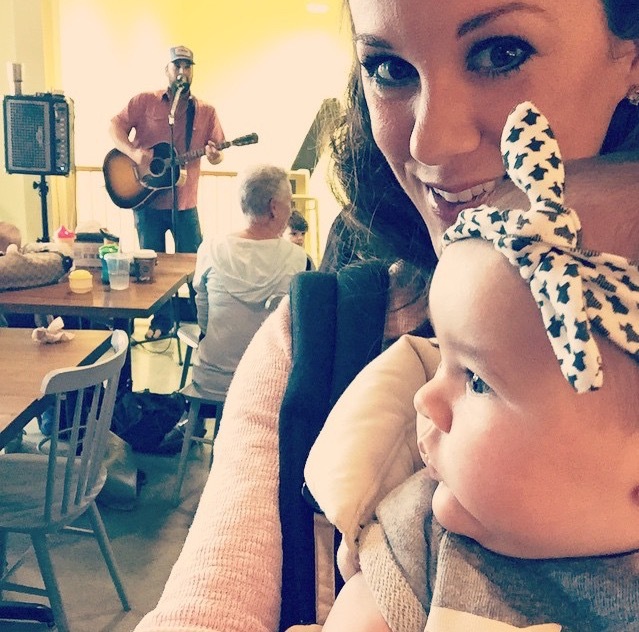 Rockin’ out to Mondays with Mr. Will at Whole Foods Market — his Texas Country spin on children’s music is the best!